Physical diesel markets are showing signs of tightness, and this should continue for now given that turnarounds are in full swing. For the next two or three weeks, there will be strong price action at ARA as prompt supplies are needed to fill the hole left by refinery works, but the end of works will see a return of the choppy price action that has made trading difficult all year. 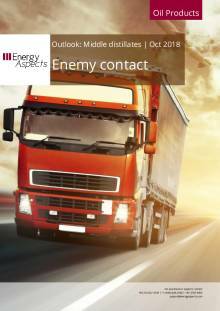 Indeed, European demand was soft in September amid agricultural weakness and lukewarm heating oil demand (again), while supply was stronger as refiners lifted yields as gasoline markets slumped amid oversupply. Europe was thus better supplied in early October than we had expected. After building by 9.5 mb in August to 423 mb, European commercial diesel stocks were probably flat in September. Yes, there will be draws in October and November, but stocks are still unlikely to fall to low enough levels to trigger a decisive price rally this winter. Even with Asian markets performing well as strong Chinese demand limits exports, Atlantic basin builds will come in December—particularly if both European and US diesel stocks move into a small y/y surplus in December, which we think is looking ever more likely. But those hoping for a catastrophe must be careful, as gasoline’s implosion means diesel is the only margins game in town and cracks can’t fall much before causing run cuts. We see stalemate. Record low water levels on the Rhine continue to hamper heating oil barge movement to central Germany, and there is a strong belief in the market that once the waters rise, ARA will see a heavy bid. But overall German inventories were slightly above the five-year average in August, so there will be no urgency to build stocks in a backwardated market. This poses an acute problem for anyone wanting to take a bullish view on the diesel market for the winter. We have seen time and again that the ARA diesel market (and by extension ICE gasoil), is more than happy to dance to its own tune when the local market is out of sync with the broader market. Diesel demand in the Netherlands and Belgium ranges between 0.43 mb/d and 0.51 mb/d, while local refinery supply typically exceeds this by up to 0.2 mb/d—the equivalent of more than 20 MR cargoes a month. This situation will worsen once ExxonMobil’s 0.21 mb/d Rotterdam refinery completes its hydrocracker upgrade in November, which will add another 20 thousand b/d or more to local diesel supplies. Coming on top of upgrades at Shell’s 0.4 mb/d Pernis refinery and Exxon’s nearby Antwerp plant, the structural supply overhang at ARA is getting a lot worse. US diesel stocks have fallen by nearly 8 mb over the last month thanks to a huge US Midwest turnaround slate, but much as works ease in November US supply should rise sharply. Moreover, with gasoline cracks getting hammered by oversupply, regional diesel yields are almost certain to be high. USGC diesel supply could be 0.1 mb/d higher y/y in November and 0.17 mb/d higher y/y in December. All that said, we are not trying to paint a bearish global diesel picture here. Asian diesel demand has picked up and Chinese refiners have been wrongfooted this year by how strongly Chinese demand has risen. The bottom line, however, is that beyond some short-term support the Atlantic basin has a bit of a mountain to climb to get back into an unequivocally bullish position.